Ed Steinman is passionate about spreading the word about Winship after his wife's treatment here for myeloma. "I became a patient involuntarily, but my husband chose to become a dedicated Winship volunteer," says Lory Macrate. When Lory was diagnosed with multiple myeloma in 2011, her husband, Ed Steinman, decided to do whatever he could to support her. "I wanted only the best care for her. Location didn't matter," Steinman says. They were both surprised to discover that the best care was within a short drive of their home north of Atlanta. "My diagnosis was the bad news, but the good news was that the best myeloma program in the country/world was right here at home!" says Macrate. 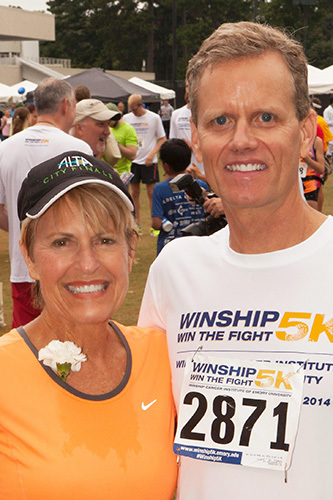 Now that his wife's health has stabilized, Ed is passionate about spreading the word about Winship. "To have Winship in Atlanta, supported by an academic medical center like Emory, was precisely what we needed," says Steinman. "I realized that many families in Georgia didn't understand that or thought Winship was more expensive. So it's a personal mission to promote the differences and advantages of being treated at Winship." Ed continues to feel thankful that his wife, Lory, is still alive. And Lory is grateful for Ed's advocacy on behalf of her and others. "I'm so proud that he's made it his mission to improve and enhance the patient experience for all patients," she says. "He's my hero and hopefully will be a hero for other patients as well!" 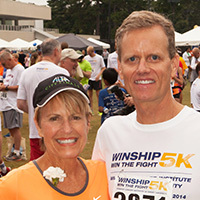 Lory Macrate and Ed Steinman at the Winship Win the Fight 5K.